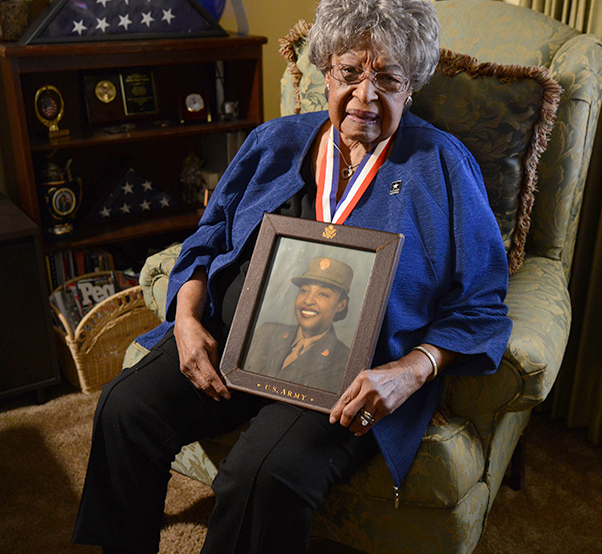 Millie Dunn Veasey wears her World War II medallion and shows a photo of her in uniform during World War II. The photo she holds was taken when she was stationed in England. Millie Dunn Veasey, now 100 years old, said her life changed in ways she never could have imagined when she joined the Army. That an African-American woman enlisted during World War II was the most unlikely of events, she said, recounting her childhood leading up to that moment. 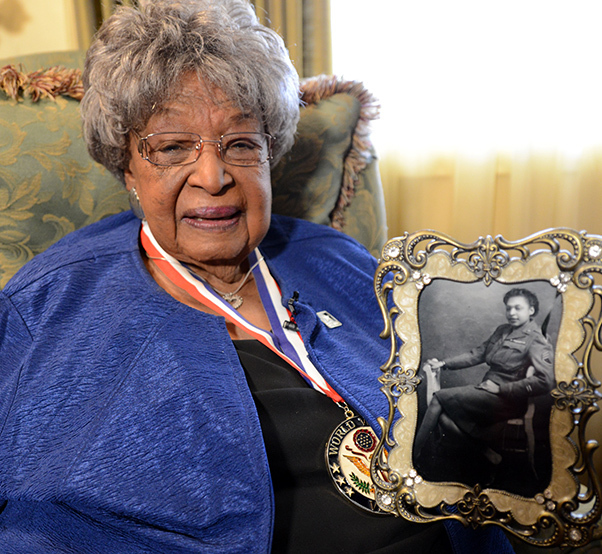 Born on Jan. 31, 1918, just nine blocks from the capitol building in Raleigh, North Carolina, Veasey described herself as a homebody. She never once left the city, population about 44,000, which she said back then had a small-town feel to it. And, she was just fine staying put, not hankering for travel or adventure. Besides, there was much to do in Raleigh, she said. Going to the movies was one of her favorite activities. Since the South was segregated, African-American citizens would go to the Royal Theater, while white citizens would attend the State Theater. Two of Veasey’s classmates at the all-black Washington High School had light skin, she said. They used to brag about going to the State Theater, passing themselves off as white. It was satisfying to see them flouting the Jim Crow laws, Veasey said. Family life was good too. She remembers attending church with her maternal grandparents, Essex Eli and Millie Gunter Henry at the First Baptist Church, where her grandma sang in the “Sunshine Band.” Both were born into slavery, she added, but they never talked about it with her. Despite having a wonderful childhood, Veasey described herself as frail and often sickly. “My mother said as a youngster they thought they were going to lose me because of maybe some medical kinds of thing,” she said, citing pneumonia, diphtheria and throat soreness as some of the illnesses she struggled with during her younger years. 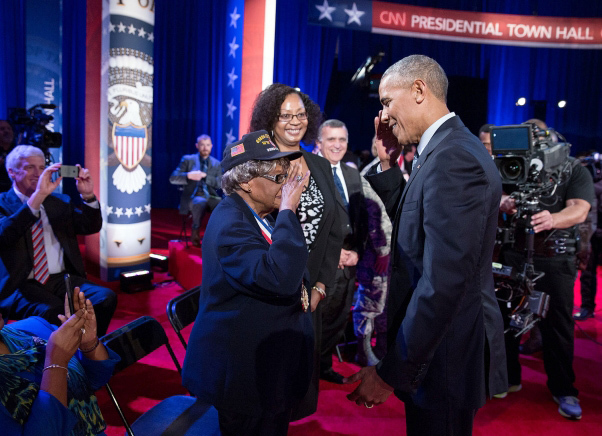 President Barack Obama returns a salute from Millie Dunn Veasey, who served as a staff sergeant in the Women’s Army Corps during World War II. The event was a town hall meeting on Fort Lee, Va., Sept. 28, 2016. The family didn’t have money to send their kids to college, so after graduating from high school, Veasey landed a job doing clerical work with the Wake County Extension Office. She said the job was created under President Franklin D. Roosevelt’s New Deal Program, launched during the Great Depression to increase employment. Then, on Dec. 7, 1941, World War II started for the United States. Veasey’s insular world would soon change forever. In 1942, Veasey’s older brother Eugene enlisted in the Army. “I was so proud of him,” she said. Also, that same year, she began seeing posters exhorting women to join the Army to “free a man to fight.” The posters, she noted, all featured beautiful white women in uniform. While it was somewhat novel for African-American men like her brother to join the Army, she said it was unheard of for African-American females to join. “But I thought to myself that if those white women can do it, so can I,” she said. “And besides that, my country needs me.” So she made up her mind to enlist. Learning of her intentions, her mother warned her against joining because she didn’t think her little girl could handle the physical exertion. The 24-year-old weighed just under 100 pounds. Before leaving for the Pacific theater, her older brother also told her she was “too fragile” for Army life. He strongly suggested that she stay home. 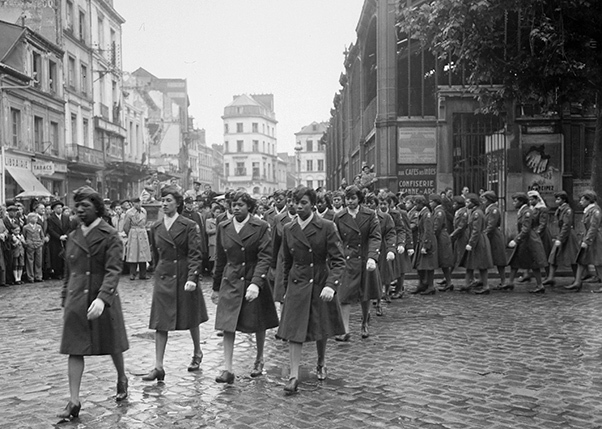 The 6888th Central Postal Directory Battalion, an all-black female unit of the Women’s Army Auxiliary Corps consisting of 855 women, marches through Rouen, France, in a victory parade at the end of World War II. Despite the warnings, Veasey enlisted in December 1942. 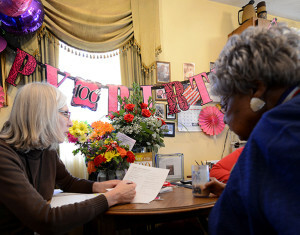 The next month she left Raleigh for the first time, on a bus to Fort Bragg, North Carolina. The physical and written exams were tough, she said. Of the 21 women taking them, just three were selected, including herself. Veasey said she surprised herself and attributed passing to grit and determination. It was her coming-of-age moment. That experience and others that followed in the Army helped to shape her life and gave her the strength to become a leader in the civil rights movement later on, she noted. For basic combat training, Veasey said she was shipped to Fort Des Moines, Iowa, in April 1943. Of all that happened there, the one incident she recalls was being issued oversized galoshes during a rainy spell. They didn’t fit her narrow, size AAA feet and she ended up flopping around in the muddy pathways, getting drenched. 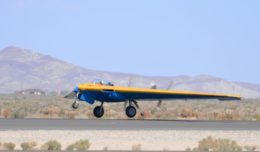 From there, she went to a number of training sites, from Fort Clark, Texas, to Camp Maxey, Texas, and finally to pre-mobilization training at Fort Oglethorpe, Georgia. Millie Dunn Veasey wears her World War II medallion and shows a photo of her in uniform during World War II. Because of her background as a clerk-typist, she said the Army assigned her to the 6888th Central Postal Directory Battalion, an all-black female unit of the Women’s Army Auxiliary Corps consisting of over 800 women. The WAAC later became the Women’s Army Corps. The 6888th would become the only all-black, all-female unit to serve overseas during World War II, she said. Also, their commanding officer, Maj. Charity Adams Earley, was the highest-ranking black female in the U.S. military. In early February 1945, Veasey and others from the 6888th boarded a troop ship in New York, bound for Europe. The six-day voyage was miserable for Veasey because she was seasick the entire way. Their boat also came under attack from German U-boats, narrowly escaping being torpedoed. When they arrived in Glasgow, Scotland, a number of natives lined the dock to witness their arrival. One of them loudly exclaimed: “Look at the women. They’re all in technicolor,” she said laughing, noting the local citizens had never seen people of African descent. Millie Dunn Veasey meets with Becky Betts, a physician assistant with the local Veterans Affairs hospital. Birthday decorations still adorn the Veasey house for 100th birthday celebration, Jan. 31, 2018. A number of rockets hit the city while she was stationed there, and Veasey said she became proficient at ducking for cover in underground shelters when the air raid sirens sounded. Over the next few months, the 6888th processed millions of pieces of mail, she said, adding that she hopes her small part contributed to the morale of the troops. Although the Soldiers worked long, hard hours, Veasey said there were opportunities for relaxation. For instance, the family of a British colonel used to invite her to their house for tea and hors d’oeuvres. During one visit, the family took a picture of her in uniform on their ornate chair, a photo she still has with her today. By early May, the allies had reached Berlin. Veasey was granted leave then, and she traveled to London. Much of London too had been destroyed by the bombings, she said, noting that the pictures of the rubble of the World Trade Center following the 9/11 attacks brought back memories of the devastation she’d witnessed in Europe. But some important landmarks in London survived the bombings. Veasey was able to see Buckingham Palace, Big Ben and London Bridge, among others. She vividly recalls standing below the Great Bell of the clock known as Big Ben, when a large commotion occurred. It was May 8. Victory in Europe had just been declared and people everywhere were cheering. A few days later, she and the 6888th embarked on a ship for France. Although the war in Europe was over, the occupation by the Allies would last a while longer, so the 6888th was still needef for their vital role in mail distribution. The unit was now stationed in Rouen, in northwest France. For Veasey, the move also involved a change in responsibilities from postal clerk to supply sergeant. She said she remembers that at the time, the female Soldiers were housed in primitive barracks that may have actually been a barn. She said she remembers the women of her unit sleeping there on straw. As supply sergeant, Veasey become something of a hero to her fellow Soldiers, she said, after procuring mattresses for everyone to sleep on. A highlight in France, she said, was that she and her unit participated in a French parade that both honored Joan d’Arc and celebrated victory in Europe. It was fitting, she remarked, that the female Soldiers were honoring the heroine. Later in 1945, the Army selected Veasey to attend Officer Candidate School, but she declined. She said her reason for enlisting had been to support the war effort. Now that the war was over, she wished to return to her friends and family in Raleigh. Veasey set sail for New York and out-processed at Fort Dix, New Jersey, in December 1945. During her time in the Army, she attained the rank of staff sergeant. 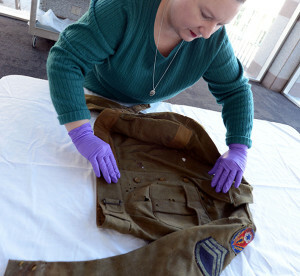 Paige Myers, textile conservator at the North Carolina Museum of History in Raleigh, shows Millie Dunn Veasey’s Eisenhower jacket, worn during World War II. Upon returning home, Veasey said she took advantage of the G.I. Bill to further her education. It was a godsend, she said, because otherwise she would not have been able to afford going to school. Using her benefits, she graduated from St. Augustine’s College with a bachelor’s degree in business administration. Later, she attained a master’s degree in business administration from North Carolina College. Over the course of the next 30 years, she worked in a variety of business administration jobs at St. Augustine College. In 1949, she married Warren L. Veasey, who brought two children with him into the new family: Juanita and Warren Jr. Her husband passed away in 1961 and she never remarried. The self-described homebody had finally settled down to live a fulfilling but uneventful life, or so she thought. Having lived in England and France, Veasey was exposed to a world without segregation that was much different from North Carolina, where “separate but equal” was still enforced. People of color had fought and died for freedom in America’s wars, Veasey said. Now, those same people wanted equal treatment. Veasey wanted to become part of that cause, so she became an active member of the Raleigh/Wake County branch of the NAACP. Although she was in her 40s at the time, she said she went with young people to “sit-in” movements at lunch counters in downtown Raleigh where blacks were not allowed. She added that some white people supported them as well. In 1963, she helped organize a bus trip to Washington, D.C., where she participated in the Aug. 28 March on Washington. As an organizer, she had a front row seat near the Lincoln Memorial where Dr. Martin Luther King Jr. delivered his “I Have a Dream” speech. At the time, she recalls the speech as very stirring but not particularly out of the ordinary, since black ministers in Raleigh also spoke eloquently and with great passion in a similar fashion. But today, she said she realizes that she was a witness to history being made. Soon, she too would add to that legacy. Veasey continued to organize behind the scenes in the NAACP. She said that probably no one at the time realized she had served during World War II and she didn’t think it was any big deal. Her efforts were rewarded when in 1965, she became the first African-American female president of Raleigh/Wake County branch of the NAACP, a post she held until 1968. She met several times with Dr. King and also with Thurgood Marshall, the first African-American Supreme Court justice. In 1966, Veasey also arranged for Dr. King to speak in Durham and Raleigh. Veasey, who spent a lot of time with her grandparents as a child, said that if they had been alive during the civil rights movement, they would have been pleased, since both had been born into slavery. When Veasey mustered out of the Army, there was no victory parade for her or the 6888th, she said. But over time, the nation began to recognize those who served — including African-Americans in particular. While Veasey left the Army in 1945, she said she continued to serve, but in a different capacity. From 1993 to 2013, she served as post adjutant for American Legion Post 157. Recently, the North Carolina Museum of History in Raleigh heard about Veasey’s story and asked if she still had her uniforms, said Earl L. Ijames, a curator at the museum. She had her olive-color wool trousers and Eisenhower jacket, which she said she would donate to the museum. But decades of being in an outdoor storage shed had taken its toll on the uniforms, said Paige Myers, textile conservator at the museum. Insects had eaten numerous holes in the uniform, and it is considered in poor condition, she added. Ijames said the museum is fortunate to have the uniforms, along with the story that goes with them, and they will be a valued addition to the museum — especially since Veasey’s uniform is the only one of its kind known to exist. Veasey is only one of three surviving women of the 6888th and the other two women do not know the whereabouts of their uniforms. Asked what her secret is for living a long life, Veasey said she thinks it is being kind to others and helping other people. “If you can do something for someone then you should do it; in turn, they will do something for you or for someone else,” Veasey said. She also said she loves chatting with young people and that it energizes her. A number of media were at her house for her 100th birthday celebration and she said she loved answering their questions and asking some of her own. Another thing that keeps her going is taking an active role at St. Ambrose Episcopal Church, where she’s been a Sunday school teacher, a choir member and church secretary. Veasey noted that when her brother returned from Burma, he never discussed what it was like. Neither did her younger brother, who went off to fight during the Korean War. People just didn’t talk about it, she said. They went on with their lives. Perhaps the biggest change in her own life, Veasey said, was joining the Army. She said the Army provided structure to her life, taught her how to organize and helped to boost her sense of self-worth and dignity.